Sony has released the Spider-Man: Into the Spider-Verse script online. Marvel fans can either download or read the entire 132-page script direct, and relive the movie while getting a wealth of background information that moviegoers might not have noticed watching it for the first time. It shows just how much detail went into making the groundbreaking animated film and how much the creative team had to work together in an effort to make sure that everything worked out bringing the story from the page to the big screen. Spider-Man: Into the Spider-Verse has been hailed for its visual aesthetic, something that screenwriter Phil Lord talked about long before the movie hit theaters. Lord wanted the movie to jump off of the screen and look like a comic book that has come to life, which it does. But, the look and feel of the movie aren't the only thing gaining praise. The story that Lord wrote has also caught the attention of Spider-Man aficionados who appreciate all of the references to the comic book source material and the shout-outs to the previous movies. Gaining access to the entire Spider-Man: Into the Spider-Verse script shows just how much Phil Lord and Rodney Rothman were dedicated to the source material, including some of Spider-Gwen's story, which is not shown in the movie. Sony has already given a green light for a sequel, so perhaps we will see more of what is teased in the script. It's also pretty cool to read the script in its entirety because not even the cast was allowed to read the whole thing at once as a security measure. Marvel Studios is pretty strict about their security and it looks like Sony followed suit. 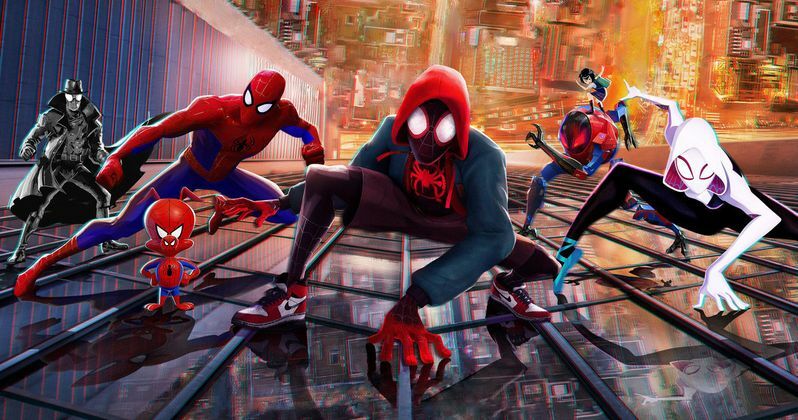 Cast members were only given a few pages of the Spider-Man: Into the Spider-Verse script at a time, much like the cast of Infinity War and Avengers: Endgame. The actors in the movie still probably have no idea how the full story of Endgame works out in the end. Now, the voice cast of the animated take on the Spider-Verse can read the entire script for the first time along with the general public. Spider-Man: Into the Spider-Verse is a success for Sony, but it hasn't been able to truly breakout at the box office due to the stiff competition. The DCEU's Aquaman is currently dominating the box office and The Grinch along with Bumblebee and Mary Poppins Returns are proving to be a major roadblock for the movie. However, Spider-Man: Into the Spider-Verse has already made its money back and a sequel is already in the works. Let's just hope that they can crank out a script that's as good as this one and that the studio releases the movie at a time when there is less competition floating around. You can head over to Sony to either read the Spider-Man: Into the Spider-Verse script online or download a copy, free of charge.